Suspicions that Interior Secretary Ryan Zinke is working with the Halliburton oil giant to build a long-sought brewery in Zinke’s Montana hometown are being pooh-poohed by his department. 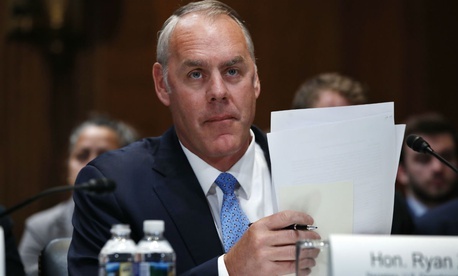 As first reported by Politico, three House Democrats in June asked Interior Department acting inspector general Mary Kendall to investigate reports that Zinke was cooperating with Halliburton Chairman David Lesar on a shared parking lot in Flathead, Mont. That facility might eventually include a craft brewery allegedly sought by Zinke on land owned by the Zinke family’s Great Northern Veterans Peace Park Foundation. The three Democratic ranking committee members cited exchanges between Zinke and Casey Malmquist, the general manager of SmartLam, a cross-laminated timber manufacturer that develops land in Whitefish. Politico’s reporting suggests that Zinke and his wife Lola have “made no secret of his dream of opening a microbrewery in his hometown,” pointing to a 2012 plan submitted to the Flathead city council, and alleged meetings with developers in Washington after Zinke became Interior secretary. Halliburton, which stands to benefit from many of the Trump administration’s energy and deregulatory policies, has been planning a construction project in Flathead, according to news reports. Interior Press Secretary Heather Swift on Thursday told Government Executive that Politico’s reporting is “wildly misleading” and that it contains “fictitious bits” that local reporters have contradicted. The developer Malmquist, according to reporting in the Flathead Beacon, said the national reports of Zinke’s alleged conflict of interest have made a “mountain out of a sled hill.” He added that he has worked with Halliburton chair Lesar on investments for decades and that the property has long been envisioned as a development site. Halliburton did not respond to inquiries by publication time.